It’s three weeks to the TAF sixth annual fundraising lecture and dinner from at 7pm on Saturday 13th of October at Epsom Down’s Racecourse. It will be a fun evening in cosy surrounds, with a heart-warming blend of top class live entertainment (come and find out! ), fine cuisine, raffles and frenzied auctioneering as we fundraise to change lives. More than 20 children and young people already touched and more looking to us. ‘Trusted relationships matter. 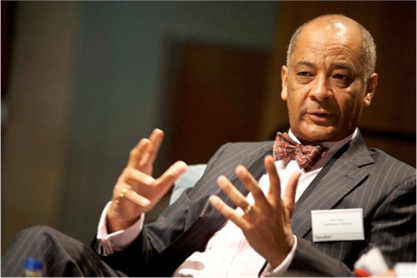 Develop mentors, sponsors and protégés as you develop your skills and experience and you’ll be amazed at how far you can go.’ -a top career tip from our illustrious guest speaker, Andrew Fairbairn, the founder and Chief Executive of SEO London. Do come along and hear about his fascinating journey and how he is opening the door for young people today. Thank you to those of you who have already confirmed your places. For those yet to confirm, now is the time to do so. Sound the gong to friends and colleagues. Encourage young adults to come along too. They will not only have an enjoyable and inspiring evening but can also begin to lay their networking foundations for the future. The electronic invitation is attached. We very much hope you will be able to join us. olds. Please email info@tobiadeyemifoundation.org for payment details. 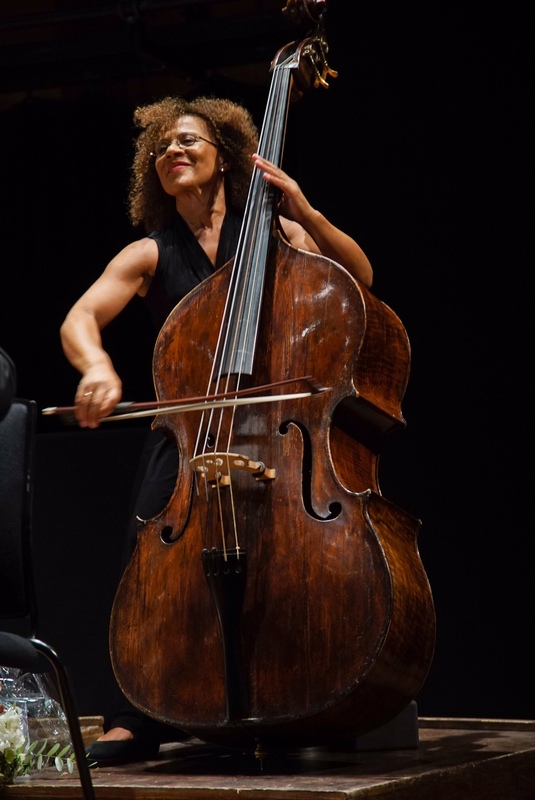 Download 2017 Overview Blog of Annual Lecture given by Chi Chi Nwanoku for full details of her lecture. Death. The word is immediately associated with negativity, sadness, loss and darkness. I have experienced it myself so this is all true. Nonetheless, I have come to realise that death can also have a higher purpose in life, even an inspiring ending. Yes, when we lose someone we love, we miss the person terribly, but the greatest life lesson that death can offer society is the legacy the person leaves behind. Legacy is the only thing that can inspire, legacy is the only thing can cause action and legacy is the only thing that lives beyond death. The Tobi Adeyemi Foundation (TAF) does exactly this. I never had the opportunity to meet Tobi Adeyemi but he sounds like my kind of guy – intelligent, driven and most importantly, he had a heart for people. I attended the third annual fundraising dinner and lecture for the TAF on 17th October 2015. It was held at Epsom Racecourse and the environment was relaxing and suited for the purpose. The night kicked off with drinks and networking. The one thing which I found very inspiring by the foundation dinner was that it brought together some of the most influential black people in the UK. It was very inspiring for a young professional like myself; I didn’t hesitate and I came with my networking hat on, to take advantage of the opportunity. Subsequently, we sat down for dinner, compered by an emcee whose flowery language livened up the night throughout. Dinner opened with an outstanding performance of the spoken word and music by Ife Obakin, a young person who knew Tobi and has supported the foundation from its inception. 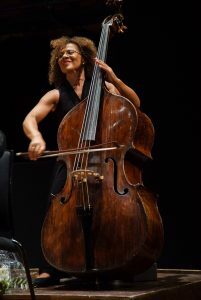 It closed with another outstanding musical rendition by Naya Reid, yet another young person who knew Tobi and was keen to give back. We had speeches from the Chairman of TAF, Seyi Obakin, and the guest speaker Karen Blackett, the CEO of MediaCom UK. Mr Obakin spoke about the importance of giving a helping hand to others in order to help them realise their potential. In fact, he demonstrated how everyone has potential but how some people needed just a bit of help to maximise their potential. He thanked everyone for supporting the charity and enabling it to be that helper for some young people. The highlight of his speech for me was when he spoke about the impact the charity had on some of the scholars. It was truly inspiring. One of the scholars who attended the event had completed his ‘A’ Level studies with exceptional results and has already taken his place at Imperial College London. Another scholar who also attended was able to carry on his studies at Whitgift School at A levels to harness his potential and also focus on his football career (he recently got signed to Charlton FC). Yet another scholar is now taking a gap year after securing all A Grades in his ‘A’ Level studies. All I can say is that Tobi would be proud of what he has done. Ms Blackett gave an amazing speech/lecture; she took us through her life journey to becoming CEO. She spoke briefly on the importance of recognising the people who got her to where she is; she called them “cheer leaders”. The key message I got from her was that we should all LEARN, EARN and SERVE (our ultimate goal in life is to give back). Ms Blackett was kind enough to answer a few questions that covered a number of topics such as some of the struggles she faced being female in a male dominated industry and how she turned what was seen as a disadvantage to an advantage. She also answered a question on how parents can support their children in situations where the children choose to pursue a very different career path from one which the parents are either familiar with or even like. I learnt a lot from a national leader. 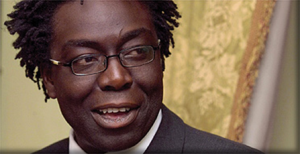 At the end of Ms Blackett’s speech, Dr Adegbenga Adeyemi, Tobi’s father, thanked the speaker and everyone. He noted that Tobi would have graduated from university this year and would have been delighted to be in the company of such influential black people, some of whom had been his inspiration. The night then went on to fundraising. There was a silent auction and a loud auction of exotic gifts and experiences, many of which were kindly donated by various TAF supporters. There was also an expansive raffle in which there were many winners. 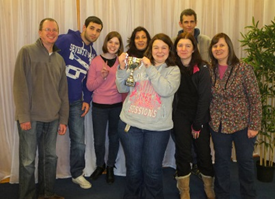 All the proceeds from Sutton Christian Centre’s renowned Quiz night were kindly donated to the Tobi Adeyemi Foundation. Thank you to all the participants and congratulations to the winning team. The Foundation is extremely grateful to 29 golfers, who enthusiastically set off in typical English inclement weather, to do justice to the challenging Surrey National Golf club, Caterham, Surrey. Majority of golfers completed the 18 holes, whilst some wisely decided to take advantage of the club house facilities and relax with friends. Our thanks also go to the non- golfers who were present for the dinner, prize presentations, raffle draw and auction. 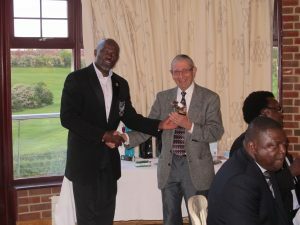 The President of Nigerian United Kingdom Golfing Association (NUGA), Mr. Tony Sokan, presented prizes to the winners of division 1 and 2 categories of competition, as well as longest drive, nearest to the pin and lowest gross. Some of the winners of the evening included Mr. Kenny Adejolu, Mr. Femi Adesanya, Pastor Omasan Oritsesan, Mr. Simon Oladunni, Mr. Abo Adeoye and Pastor Olu Fasanya. The Foundation also thanks the management of Surrey National Golf club for their support and generous donation of several auction prizes. All our generous participants helped raise a net sum of nearly £2,200 for the Foundation. The foundation is grateful to all who supported the Golf Classic and made the event a greater success than the first. We hope to welcome more golfers and non-golfers back to Surrey National next year for the 3rd Tobi Adeyemi Foundation Golf Classic. 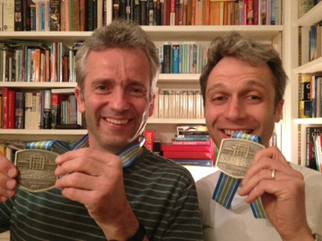 Ric Adams once again ran the Brighton Marathon (and the Surrey half marathon) to raise funds for the Foundation. Gbenga Adeyemi, Tobi’s Dad was at the Brighton Marathon finishing line to congratulate Ric on completing the race. The foundation is very appreciative of Ric and his sponsors for raising vital funds for the Foundations work. Like Victor before him, Ken was brilliant. He spoke of the huge difference that the generosity of strangers can make in the world that we live in. First, he recalled how his headmaster in junior school had prepared him in various ways for the future to come, including how to enjoy caviar. Then he recounted how, after losing his meagre belongings and textbooks to car thief, a storeowner and a complete stranger offered him a discounted suit including a Christmas job. Next he spoke of how serendipity brought him in contact with Norman Knight, one of Boston’s biggest philanthropists in the 1980s. Norman Knight went on to help him in various ways, including becoming his mentor and great friend. His conclusion? We are all strangers to other people and we have a sacred obligation to help others. Furthermore, we should keep our eye on what contribution history will view us as having made when we are gone. We should ‘do well, do good’. On the 8th of May 2014, 24 golfers gathered at the prestigious Surrey National Golf club in Caterham, Surrey to participate in the inaugural Tobi Adeyemi Foundation Golf Classic in support of the Tobi Adeyemi Foundation. Mr. Tony Horswood receives prize from Captain of Nigerian United Kingdom Golfing Association (NUGA), Mr. Olumuyiwa Obileye. Although the weather was not ideal, the 24 golfers enthusiastically took to the fairways to play for the foundation. Despite the poor weather conditions the standard of play was very high. The evening saw non-golfing guests joining the players for dinner, prize presentation ceremony, raffle & auction. 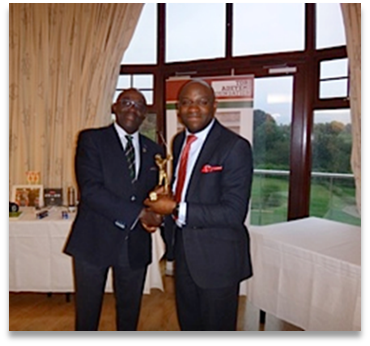 The prizes were presented by the Captain of Nigerian United Kingdom Golfing Association (NUGA), Mr. Olumuyiwa Obileye, to the winners of division 1 and 2 categories of competition, as well as longest drive, nearest to the pin and lowest gross. Some of the winners of the evening included Mr. Layi Akano, Mr. Femi Adesanya, Pastor Omasan Oritsesan, Mr. Abo Adeoye, Mr. Victor Ogunbusola, Dr. William Akpala and Mr. Ayo Oshowo. The overall winner was Mr. Tony Horswood. Through the generosity of all those who participated and other supporters the Foundation raised over £2,000. The foundation is grateful to all who supported the Golf Classic and made the event a great success. We hope to welcome golfer and others back to Surrey National next year for the 2nd Tobi Adeyemi Foundation Golf Classic. On the 6th of April our brother & friend Ric Adams, again put on his running shoes and completed one and half marathons for Tobi in Brighton. 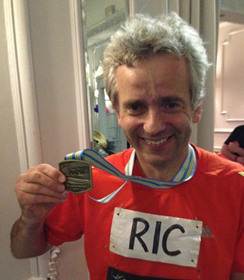 The Foundation is immensely grateful to Ric and his generous sponsors for raising £260 for the Foundation. The Foundation adopted two Tobi Adeyemi scholars. They both secured 90% scholarship and the Foundation enabled them to take their places by offering 10% grants. Adrian Lewis, Chairman, Kingdom Bank, needed to lose some weight. He also wanted to support the Tobi Adeyemi Foundation. How to do both? Give a pound to lose a pound! Adrian said ‘I knew I had to have some accountability. Having people watching me motivated me to reach the goal’. Just like a true financial giant will do, Adrian monitored his progress on a graph and reported it regularly. 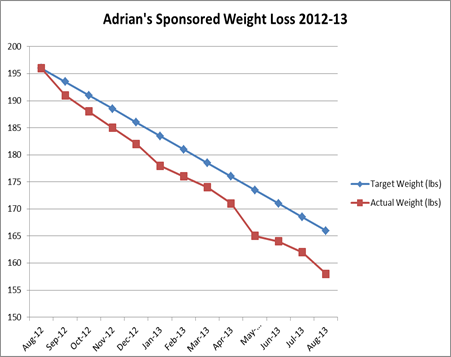 His final graph, displayed here, shows that he exceeded his target weight loss of 30lb. 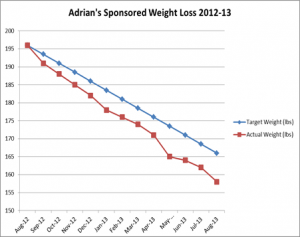 Well done, Adrian – now to keep it off! The Foundation is grateful for the £942 raised by Adrian and his sponsors. 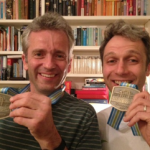 Ric Adams and Tim Devenish of Sutton Christian Centre tackled the Brighton Marathon in April for the Foundation. 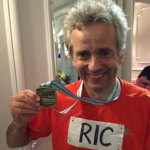 Ric loves running and ran the same race last year for the Foundation but he met his match this year. Finishing in a respectable time of 4:26:22 he was nevertheless a full 3 minutes slower than Tim. He says Tim is the younger man and, of course, there is always next year. Asked why he did it again, Ric said ‘…. well, although I’m not the fastest, I really love running and if I can run AND raise money for the brilliant TAF, then that’s a win-win! The Foundation is grateful to Ric, Tim and their sponsors for raising nearly £1,000 for the Foundation. Many thanks to Melanie Rodger who kept her promise to spend a day in traditional Nigerian attire after raising £100 for the Tobi Adeyemi Foundation. A very big thank you to Ife Obakin, she raised £305 for Tobi Adeyemi Foundation by dressing as Wally from the ‘Where ‘s Wally?’ books! 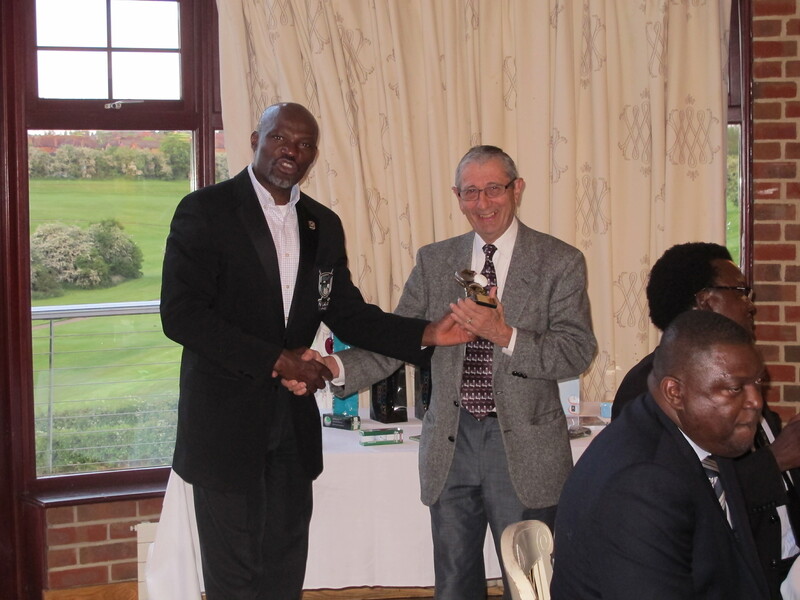 The Nigerian UK Golfing Association adopted the Tobi Adeyemi Foundation as their Captain’s Charity of the Year. £2,220 was raised for the Tobi Adeyemi Foundation. Thank you to Captain Ayo Oshowo and the entire NUGA members.